So I went on a bike ride up Leatham Hollow twice. The reason that I went more than once is that I didn't quite make it to the end of the trail the first time. The ride up Leatham Hollow is for the most part a decent ride with only a short distance where the incline is rather steep. There is also a section on the lower part of the trail that is a rocky and I just walked my bicycle over that part. So perhaps you are asking where the pictures are and so here I go on posting the pictures! Well I went on a bike ride up dry canyon just so that I could eat some Thimble Berries. I saw them last Saturday on my ride but I didn't know what they were. So tonight I decided to go and try them out and they have a little different texture than they look like they have. The berry is very good at selling itself. However the selling point is also one way it has gotten to reproduce so well. From the outside the berry looks like it doesn't have a lot of big seeds, but looks are deceiving. There are actually probably more seeds than a raspberry and so there is actually a fair amount of seed crushing going on. The berry is what I would call not domesticated. We as humans have domesticated everything we really liked and put pressure on the plants to cater to us so much so that without our help the plants would die off without us. 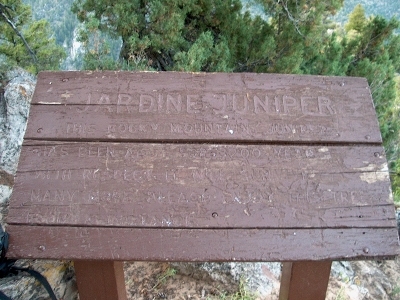 Well I went on a bike ride up to the old Jardine Juniper tree in Logan canyon. Well I should say that I really more or less sort of raced up to the tree. The trip up took me 55 minutes and I took the scenic route on top. I then took a bunch of pictures which I'll be putting up on this site once I get the functionality added. So the ride down took me about 30 minutes. I could have come down faster except it was getting dark and that was slowing the decent down. Still the time it took to ride up and down was only 1 hour and 24 minutes. In the day light I can actually come down the trail in about 20 minutes simply because I can see the trail a whole lot better. Well until I get the pictures posted. This is the tree at the end of the trail. Being in the presence of the tree made me feel young. The question came to my mind of, "What would tthe tree say if it could speak?" I decided that it wouldn't say anything that hasn't already been said on how to live one's life. The tree is 3,200 years old according to the information board that they have up there. 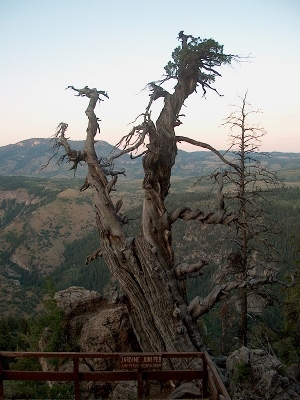 The tree is old enough to have seen wars, and civilizations come and go on this continent. It survived the three days of darkness too. 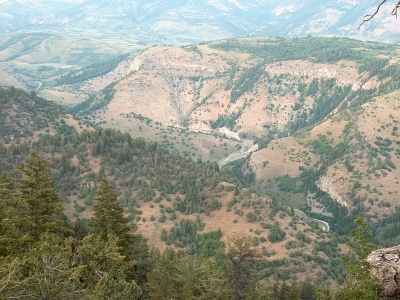 I thought I would take a picture of Logan Canyon. I would suggest not to walk straight down the mountain from the tree as the slope is very steep and I'm sure there are a few cliffs below. I don't want to have to call search and rescue. I have finally converted the webpage to process xml. I suppose I should say that the site is still in the beginning states of the xml life but it will get there. So there are three reasons and I do have more that aren't written. Just think I don't have to deal with some of the weirdness of html with my editor now. The entries don't show up in order of the date entry because they show up in the order that I edited and converted them to xml. This is correct functionality as I'll be extending by xml to deal with when entries are edited. I thought that this was a good video and so I embedded it into my site.